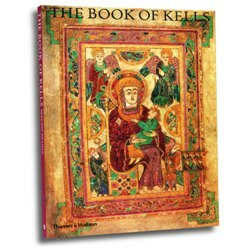 The Book of Kells is a masterpiece of medieval art-a brilliantly decorated version of the four Gospels with full-page depictions of Christ, the Virgin, and the Evangelists, as well as a wealth of smaller decorative painting. The strange imagination displayed in the pages, the impeccable technique, and the very fine state of preservation make The Book of Kells an object of endless fascination. This edition reproduces the most important of the fully decorated pages plus a series of enlargements showing the almost unbelievable minuteness of the detail; spiral and interlaced patterns, human and animal ornament-a combination of high seriousness and humor. The text is by Bernard Meehan, the Keeper of Manuscripts at Trinity College, Dublin. Paperback, 110 color illustrations, 96 pages, 7-1/2" x 9-3/4"